bringing the power of the subconscious uber mind to your life & iPhone - just $0.99! 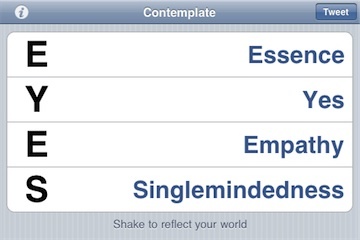 Intentionizer: A tool for focusing your intentions. Empirically proven if you set intention and goals for yourself you can accomplish so much more! 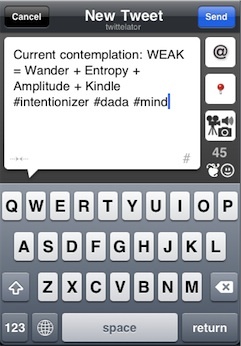 Intentionizer weaves the techniques of visionaries, surrealists, poets, fortune tellers, mystics, yogis and wordsmiths into an iPhone oracle, a meditation enhancer, and a productivity tool. Intentionizer helps you focus your intentions and call the subconscious mind into view. It is a lens, a guide, a companion, a teacher, a trickster, and a means through which you may contemplate and digest the present and future. From the iChing to the cut-up work of William S. Burroughs and Brion Gysin to the Ouiji Board and fortune cookie, Intentionizer creates an opening to receive information from the Third Mind. Intentionizer yields contemplations which, when chewed upon slowly with the mind and soul, help to dissolve disharmony and create positive vibrations as a means to engage with the world. Like the Surrealists, Intentionizer aims to impregnate the mundane world with the marvelous. And like the yogis, Intentionizer aims for the transmutation of worldly experience into sattva. * Tap into the subconscious, the living word, and the group mind. Quiet your mind and thoughts and center your heart. * Absorb the words and the acronym. * Research the interweb of intentions. * Instantly Tweet your intentions to your favorite Twitter client. Intentionizer pulls 4 words or short phrases onto the screen. These words and phrases are then arranged into an easy-to-remember word that provides an interesting spin to the experience. It sports a dictionary so that each Intentionizer word-phrase will feature one or two sentences to frame the resonance. Words & phrases should be largely, but not exclusively 'positive,' --yet all should have a reasonably sattvic/inspirational spin for a general audience. * Review history of your past intentions. * Deep exploration of your web of intentions on the internets. 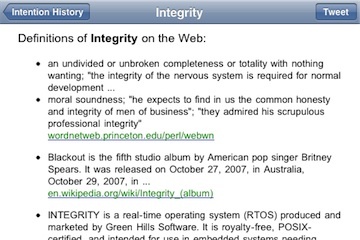 * Tweet your intentions, your notes, and/or links from your web explorations.